You’re not? Of course not, because, aside from buskers in high street or the band your friend dragged you to see last weekend, you don’t encounter a lot of live musicians, especially live musicians performing music you chose and whose sole purpose is to make your day special and exactly as you want it. 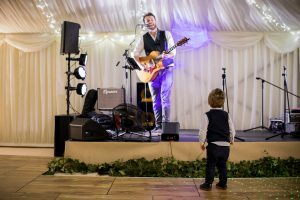 Your wedding is a special day, maybe the most special day in your life, and there is nothing more ceremonious or celebratory than live music. There are people, people like Philip from the B Street Band or Tom from Easy Feet etc, who have spent their entire lives studying and performing music. They hold a degree from Salford University in Music, as do many of their band members while others hold degrees in music from the Northern College of Music and many more. They have been given awards and grants, They have done tours, they are fancy-pants musicians, but more than anything they relish the opportunity to play for people who want to hear them. They sink their teeth into figuring out the best processional for you and curating the best dance party set list to keep your guests on their feet all night long. They want to do what they do best, and they are happy to do it for your wedding day. Aside from it being infinitely more elegant to have live music for your ceremony, the live acts are living people with eyes and ears who can adapt when the flower girl gets distracted and messes up the timing of your processional and who can add a tasteful “grand pause” for your officiant to say, “Please Rise,” just before you or your betrothed make your way down the aisle. We and the bands know more music than you do (it is our job) so when you tell us you’re having a rustic, farm-to-table barn wedding we are not going to force you into Pachelbel’s Canon in D or anything else that would be on a “Music For Your Wedding” CD , we are going to hook you up with the tastiest acoustic guitar and piano duets with that roots-y vibe you’re going for. Similarly, there is no underestimating the atmosphere that a live jazz or bluegrass ensemble creates for your cocktail hour. We promise you, it is a much better investment than M&Ms with your faces on them. When it comes to your reception, it’s really a no-brainer. Want to know what starts a party? The four or more musicians that are already having a party on stage. Real people who you can make eye contact with when you’re singing along to every word of “shut up and dance,” who are making eye contact with each other so they can communicate where the music should be going, and who have equally ridiculous dance moves as you or your friends. All our bands and live acts are all really good friends, not just hired guns told to play together. Some of the band member have known each other for more than 10 years, and some of the musicians are in other bands together. They are all so happy to be getting paid to play together and that is clear as day when we rock your reception. A live band of a high caliber has the flexibility to perform nearly every genre you want to hear. This generation is rewriting the rule books on weddings and we think it’s great. There are a lot of things in “traditional weddings” that we don’t need, and there are a lot of modern additions to weddings that are great. Live music is a tradition of celebrations since music and celebrations started. Your parents like live music, your friends like live music. Let us play some Stones, Beatles and Oasis and everyone wins. Are you interested in booking your wedding band? Get in touch 01614345264 to discuss your wedding entertainment!